There are three ways to reduce the incentive for players to dive: one, to fill the field with officials; two, to interrupt the game endlessly for examination of TV replays. And there’s a third way, simple, fair, and very effective: Examine replays after the game. If the replay irrefutably shows a dive, the player would be suspended, the length of his suspension determined by the severity of his offense. In Robben’s case I’d have had him sit out the rest of the World Cup. That would have discouraged him and others from trying it again. Meanwhile, here’s hoping Spain wins in a clean game. This entry was posted on July 9, 2010 at 12:03 pm and is filed under Ethics-general, Sports. You can follow any responses to this entry through the RSS 2.0 feed. You can leave a response, or trackback from your own site. We Americans are much more preoccupied with fairness than the rest of the world. Experiencing the World Cup in Vietnam, where soccer is something of a life-and-death matter, fortunes made and lost over one game, daughters lost to indentured servitude over bad calls in big games, I get a whole new perspective on fairness and soccer. Here, life is NOT fair, more often than it is, and everyone knows every bad call, every cheating play that has occurred in the World Cup in the last 30 years. Maradona with his winning “Hand of God” goal is a hero here. All the players perfect their “diving” techniques, and are applauded for their fine acting skills. It’s considered a part of the excitement—will they get a free kick? Will the refs catch on and yellow card them for bad sportsmenship? Will the fans riot? I think we Americans need to watch a full four years of soccer—and, most importantly, watch it with sports enthusiasts from other countries, to fully appreciate all the nuances of Soccer and to pass judgment on ethics on the field. On the other hand, being a fan of Brazil, as I know you are, you are right in there with all the other fans decrying how the game was stolen. 🙂 But, as my wise husband points out, those angry Brazilian fans will decry the unfairness of the game’s outcome, the faked injury, the stolen Cup, but they will NOT be shouting to change the rules of the game. Referees’ eyes can’t be improved–they will always get some things wrong. But rules can be improved. 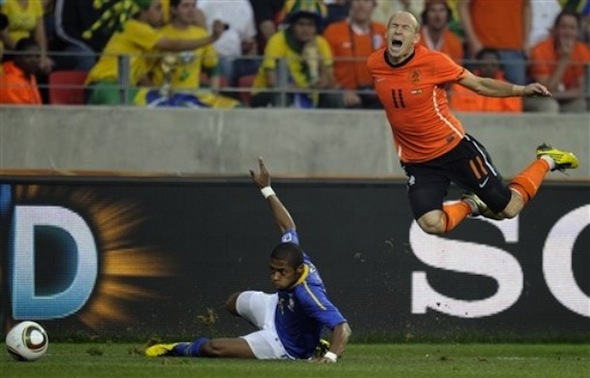 FIFA can make it lots less advantageous to dive, and that would make for a fairer game. And I bet the Vietnamese would like it more.